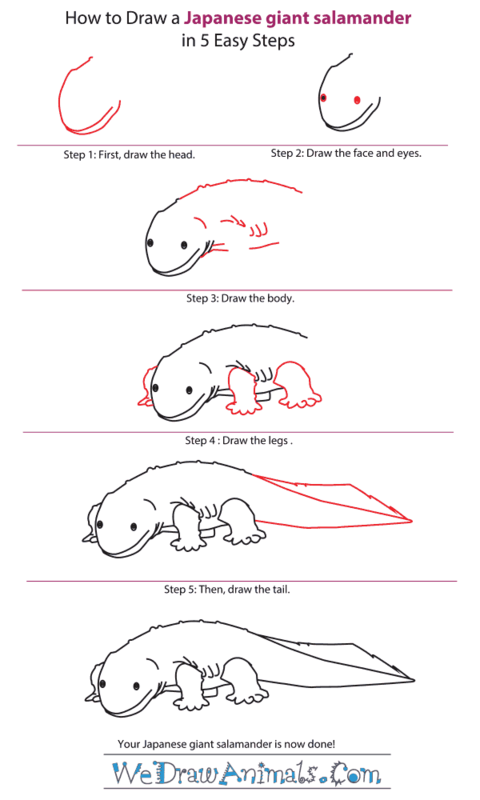 In this quick tutorial you'll learn how to draw a Japanese Giant Salamander in 5 easy steps - great for kids and novice artists. 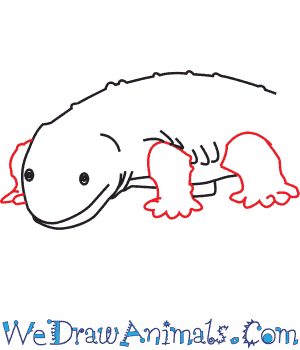 At the bottom you can read some interesting facts about the Japanese Giant Salamander. 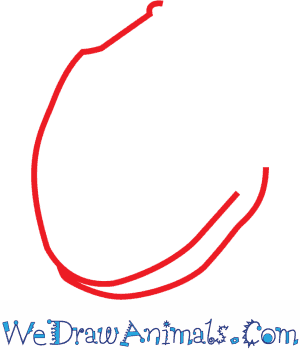 Step 3: Draw the body. The back of the salamander is bumpy, and the body has various lines. Remember to make space for legs. Step 5: Now draw the tail, which which is made up of two separate sections. Japanese giant salamanders are commonly found cold waters with rapid water flow in Japan. They are 1.5m long and weight about 25kg. They are black, grey, off-white in color skin that is wrinkled. They have two pairs of legs and their head is wide and flat in shape with very small eyes on top, which results in their poor eyesight. Their diet includes insects, worms, fish, small salamanders and snails. Despite of their horrific appearance, they pose no harm to humans. 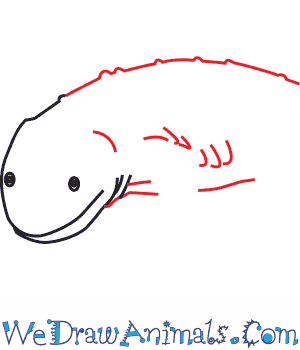 In Japan, Japanese giant salamanders are also called Ōsanshōuo, which means enormous pepper fish. Japanese giant salamanders are the second largest salamanders found in the world. They are nocturnal animals. Therefore, they have to depend on their sense of touch and smell to hunt. They breathe throw their skin! 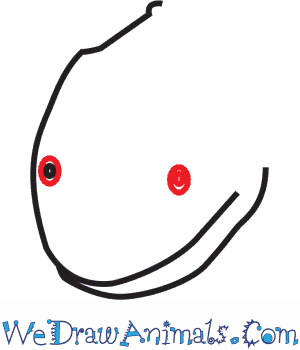 They can survive without having food for weeks due to their high metabolism rate. Males contend with each other often killing their competitor for mating. Females lay 400-500 eggs that are joined together by a string. They are listed as ‘Near Threatened’ species. Asians prepare a special dish using their skin. 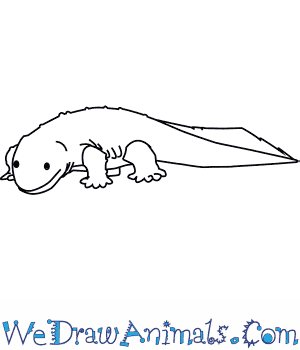 Lesson plan note: Show children videos online of salamanders competing with each other for mating. This will serve as both entertainment and education!